Fairs that use the ShoWorks Web to take and process entries online, may opt to have any payments (made through credit cards) routed directly and immediately to their bank. Processing with credit cards requires 2 additional services (these are mandatory for online payments). Gladstone does not charge any additional fees for routing online payments to your bank, however the following services do charge minor fees. Contact them directly for an explanation of fees. The following article is intended to assist you with understanding the multiple companies that are involved with a payment that is taken online from the ShoWorks Web, through the Payment Gateway Company, into the Merchant Provider Company, and finally to your Bank. Gladstone is not responsible for the service, pricing, or quality assurance of any company involved other that Gladstone itself, but rather provides compatibility with these providers to allow you a choice for your ecommerce needs. Finding a good fit for your fair with both a Payment Gateway and Merchant Provider is much like searching for a bank. You must contact them directly (oftentimes by phone) to gather and negotiate pricing that is suitable for your fair. Please note that while we make every effort to keep contact information and pricing estimates of other companies current, it is beyond our control when these companies change their information and policies. As such, the information provided below may not be current. Please notify us if we can update the information to help others. 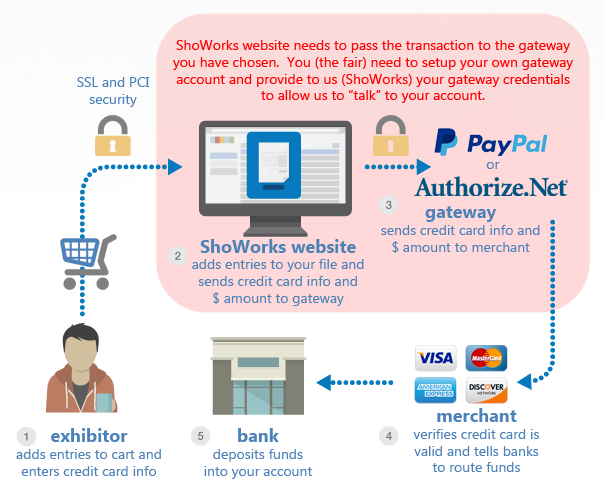 To have payments from credit cards routed from the ShoWorks Web to fair's bank, the fair must have an account with two outside services: 1) Payment Gateway which is a layer that routes the credit card information securely accross the Internet to the 2) Merchant Account Provider (Visa, Master Card, Discover, AmEx, etc.) which processes the actuall credit cards into the fair's bank. The fair may currently not have either, may already have both, or may already have a Merchant Account Provider because they take credit cards manually on the fairgrounds and only need to choose a Payment Gateway. For fairs that have neither, or are on a buget, PayPal offers an all-in-one solution called "PayPal Pro" which serves as both the Gateway and Merchant, routing credit cards directly to your bank at a very low cost (usually less expensive than if purchasing the two services separately). A few smaller "botuqie" companeis also provide helpful assistance to both a Gateway and Merchant, acting as an intermediary and often able to obtain better rates and provide a "hand holding" experience where you work with just one or two individuals at most. The process for aquiring any of the services above usually takes 2 to 3 business days. Choose this if: your fair has neither service, or is on a budget, or open to finding cheaper alternatives. Only choose this if: you already have your Merchant Account Provider and cannot seek other alternatives, as this option is typically more expensive. Product Name: Authorize.Net "Advanced Integration Method (AIM)"
Contact the Paypment Gateways for their pricing. 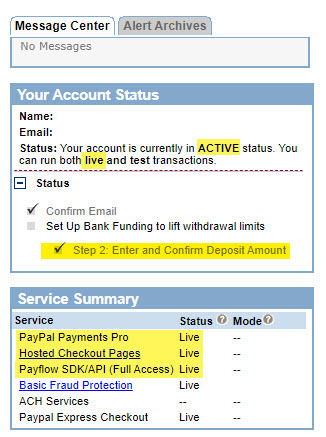 Follow the instructions provided to you by your bank or Authorize.Net on how to Activate your account. Note: Changes to PayPal's interface (out of our control) may reflect a slighty different represenation of screenshots. Once you have completed the above, you will be able to process credit cards through ShoWorks within the same business day.